chicken | My Health! My Choice! 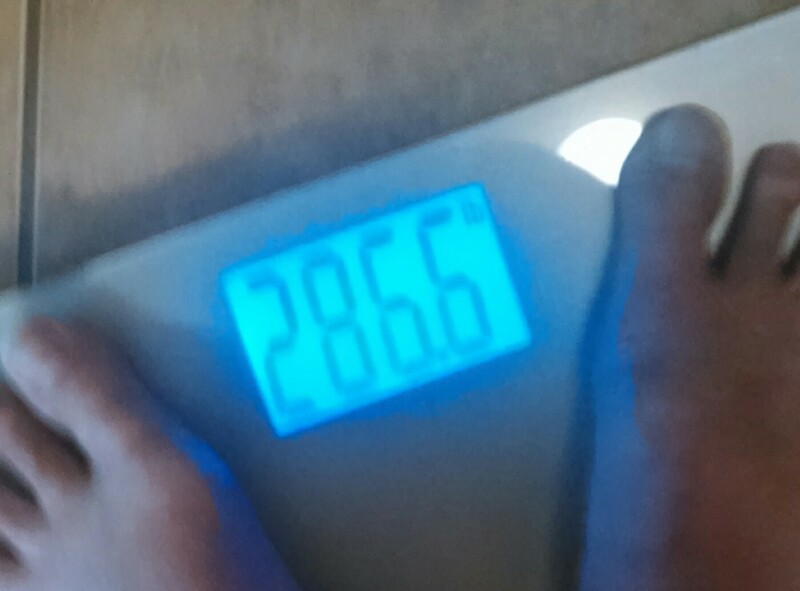 This is my first official weigh-in after changing my program a little over a week ago. About a week and half ago my doctor asked me to drop off the diet program I was on because of some abdominal pain. He thought I either had gallstones or right-side diverticular disease. Since the purpose of this journey is to build habits through healthy choices, I chose to follow his advice. I decided to drop off the actual program but keep following the principles it taught (eating small meals every 3 hours, low carb, with controlled levels of fat, and lots of fluids, etc.). A couple days later I had continued to lose weight and that was last Friday. I also discovered that my pain was caused by several factors combining with some strong antibiotics the doctor had placed me on. These had given my liver a hit and it had become inflamed. Everything is better now, no more pain. After that point, I still had a choice—go back fully onto the previous plan or stay where I was to experiment with using the principles I’d learned, without the foods purchased through the program. I chose to keep experimenting with choices to see what would and would not work. The danger was that one of my experiments would drop me out of fat burn and it would take several days of very low carb to get me back into it. I decided to check at least twice a day for a couple days with my Ketostix after each addition. The questions I wanted to answer were several. When I tried and then dropped off a famous low-carb diet back 10 years ago I quickly went on a carb bender and gained back all the weight I had lost as well as an additional 25 pounds. Because of this I wanted to see if I would do the same this time when introducing some new carbs into my routine. I added carrots, Greek yogurt, bananas, as well as the occasional onions. I also wanted to learn how the principles worked with regular store bought food. If the principles are sound, then they should not be material dependent. If the principles work with regular food then the principles are sound (and key to being healthy). If the principles did not work without the packaged foods then the foods were primary and the principles played only a supporting role. Another question I wanted to answer was whether I could actually treat this as a lifestyle rather than a formula. With a formula you follow A to B to C to D and do not waver from this. With a lifestyle you make choices naturally and easily at each step deciding the best route to get from A to D. With a lifestyle you make choices because they fit with the life you are living. With a formula your choices are limited to following the formula or wavering from it. A formula is very effective, especially when first making changes. But it can only be kept up for so long before some variety is desired. I have been living the principles I learned as a lifestyle for about a week and a half. I have used no packaged foods from my program, but only what I can buy in my local grocery store. Last week I weighed 292 pounds. This week I weighed 286 pounds. I actually weighed lower earlier in the week, but I only take whatever happens on Friday as my official weight. I lost six pounds this week only using the principles I learned and living them as a new lifestyle. Before you jump to conclusions and think there was no need for any of the other elements of my program—coaching, packaged foods, support network—you are wrong. It was these that helped me to learn the principles I now follow. It was these that made practicing them easy. To try to jump straight into this without that step would have lasted about a week—if that long. I know me well enough to know that early on, if I didn’t have a little box where I could go and take out a package and eat it when the alarm on my phone went off I would have given up long ago. Will I stay off of the packaged items? I don’t know. They are awfully convenient. Besides, I know if following the formula with the packaged foods there is no danger of falling out of fat burn. As it is right now, when I add something new it takes several hours to discover if I screwed up. This wait and the anticipation can be quite discomfiting. I choose to continue this way because I have questions I want to answer and because I want to practice making choices for my health. I’ve noticed after eating this way for over three months that I no longer crave the things I once craved. I don’t crave potatoes, pasta, bread (though I would still, occasionally, be willing to trade one of my children for a flour tortilla), etc. Last night my wife made chicken for our supper. I asked her how she was going to fix it (in the past she would have fried it). She said she’d bake it because of my diet. I came in the kitchen as we were getting ready to sit down and saw the chicken. It was breaded. I asked her if she had put flour on the chicken. She responded, “No. It’s not flour. It’s bread crumbs.” I got a bewildered look on my face and told her they were ultimately the same thing. She responded, “Well I can’t bake it without putting something on it. I thought you would just scrape it off.” So there I stood over the sink scraping and washing my chicken before I could eat it, even though I was hungry. The interesting thing is that I considered just eating it breading and all, but knowing it would make it harder to make my goal the idea of eating the breading actually repulsed me. I have a weight I want to get to, a level of health I want to return to, and anything that gets in the way of that is not really attractive. Last night was my first night on my diet. I cooked supper in order to make it easier on my wife. I also prepared enough for both of us. Since my wife is small, she didn’t feel any deprivation from a diet meal—as a matter of fact she couldn’t finish it. I decided to get a bit creative within the limitations. I was allowed 6 oz. of skinless chicken breast. 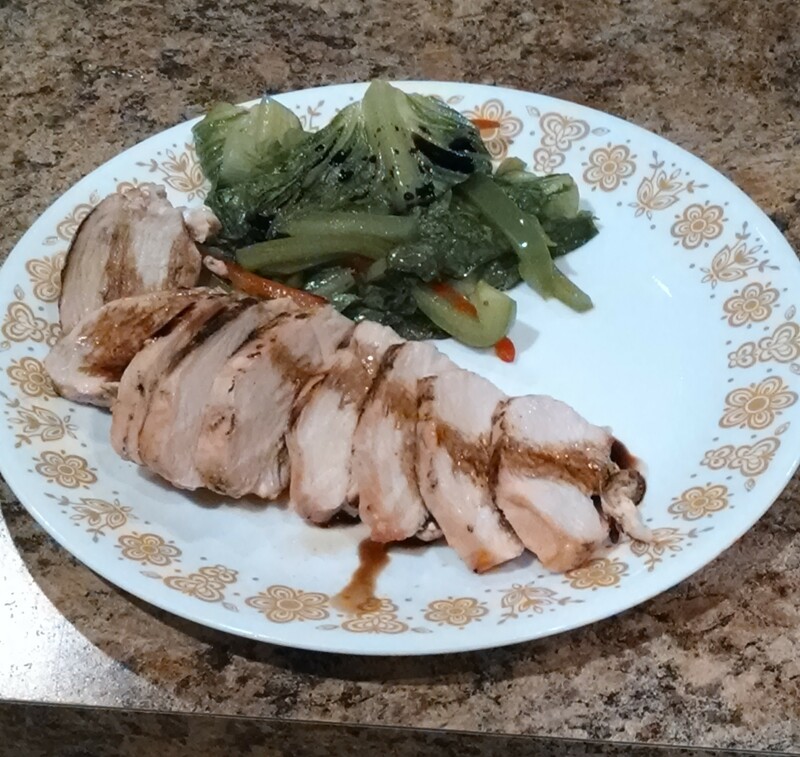 I was also allowed 1 tsp of canola oil as a Healthy Fat and 1 tsp of Balsamic Vinegar as a condiment. I started by grilling the chicken breast. When it was almost done I used the canola oil in a pan to soften some red and green pepper slices. Once finished I shut off the heat and added about a cup of Romaine lettuce to the pan, and covered to sweat the lettuce. Once the lettuce was fully wilted I rolled it around in the pan to pick up any pan goodness. Put this together on a plate with the chicken breast and drizzle with the tsp of Balsamic Vinegar (I love that stuff and could drink it). My wife didn’t finish all of her chicken, so I saved it for today’s lunch meal (about 3 ounces). That I crumbled cold over a bed of Romaine and Spinach with a few slices of white mushrooms then drizzled with a tsp of EVOO and a tsp of balsamic vinegar whipped together. While I don’t want to make any of the meals too hard, I find that these have been very simple and not taken more than a few minutes to make each—except for waiting for the chicken to grill.